"We should have opened two months before, but getting permits took much longer than we expected," he said. "Things should be busier." His wife's outlook was a bit sunnier. "Yes, we were hoping to open before Christmas, but permits and construction did take time," said Anna Ata, who also works as a dental hygienist. "Still, I like to look at things positively. We're in a nice town"
And she said she sees lots of reasons for hope: Spring is coming, and with it will come foot traffic, thanks to A Taste of Turkey's location near area a host of eateries and right near the Morristown Green. Another reason for hopefulness: The store offers a wide variety of beautiful collectibles at a huge range of prices. "We have things all kinds of people can afford," said Oscar Ata, "everything from $3.50 bracelets to a $600 bowl." The Atas have been married for about a year and a half, and the couple decided early on to dive into the field of imports and to specialize in items from Oscar's native Turkey. "We started as wholesalers," said Anna Ata. "Then we ended up doing festivals and testing the items [to see which were most popular with buyers]. Eventually, we grew big enough to have a retail store." And the couple believed Morristown would make the perfect spot. "It's a nice town, and it's busy," said a smiling Anna Ata. "It definitely has changed, with nice apartments and homes. We just thought it would be a great place." "You can see three generations walking down the street here," he said. "It's not like Hoboken, where it's all kids." Oscar Ata added that the restaurants and theater nearby attract the sort of diverse, culturally enlightened clientele that can appreciate Turkish collectibles. "We just really like the town," said Anna Ata. "There's always something to do. It's a little city on its own. "Plus there is the train station in the neighborhood that can go to New York, which is good," he said. "It's busy, but not just busy to be busy..."
Oscar Ata said "busy" is the word to describe the efforts he and his wife have taken to prepare A Taste of Turkey since they found an empty building they liked more than half a year ago. "Then it was nothing, no paint, no nothing," he recalled, noting that Mayor Dougherty himself commented on the radical change in the structure. "Just concrete walls, and they were not even supporting anything; we had to build [supports] ourselves." "We had to do everything—the framing, the electric, the plumbing, the flooring—everything," Anna Ata added, noting that Suzi's Salon & Spa inhabited the space at 43 South Street before moving to its new digs at 126 South Street. What emerged after six months of construction and a difficult, frustrating inspections process was a building transformed: Sunny yellow walls in the main showroom are filled with multicolored hanging dishes, bowls and more. Elegently appointed wood shelves offer peeks at exquisitely detailed art pieces and jewelry. The jewelry, is certified nickel- and allergy-free, said Oscar Ata, who added that he is happy to show the certification documents to anyone who asks. The store has a vast assortment of offerings ranging from candle holders, glow-in-the-dark bowls and vases and Pashmina scarves. "We've got $30 items, $10 items... even Turkish Delight," Anna Ata said, noting that they give samples of the traditional Turkish candy and hand cream to customers to try and that the store also offers gift wrapping. In future, the couple said they hope to offer table runners, tea and coffee sets and hand-carved Turkish chess sets as well. The Atas say they are proud of the products they choose to sell. 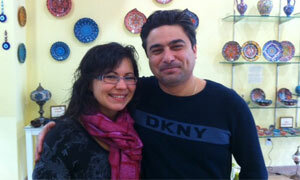 "We hand-pick our items," Anna Ata said, as Turkish music filled the air. "We'll be going to Turkey next month for three weeks [on a buying excursion]. They're all one-of-a-kind and made by different artists." Oscar Ata, who said he oversees the business end of the operation, said they were careful to offer low-priced items and more expensive collectibles to appeal to as wide an audience as possible. "But these are good quality," he said, noting that A Taste of Turkey may try marketing items from other countries in the future. "But nothing from China, no flea-market, dollar-store stuff."